Since tomorrow is Leap Day, Verizon has decided to run a 1 day sale that is worth waiting for if you are on the verge of purchasing a new phone. 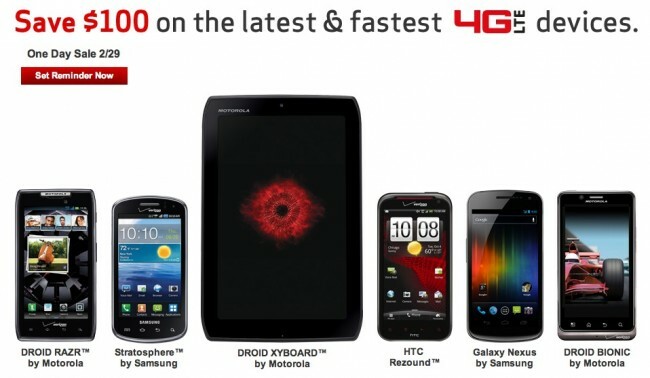 Their landing page for the special includes all of their top devices such as the Galaxy Nexus, Rezound and DROID RAZR which will be available with a $100 discount. So instead of the $299 you would normally pay for the Nexus, you can snag it for $199. And it’s tough to tell from this page, but the RAZR is currently listed at $199 and the Rezound at $99, so there is a chance we could see them at $99 and FREE respectively. I guess well know on that tomorrow.